As surgeons, we are all aware of how important good surgical training is to the quality and safety of the care we can deliver for the benefit of our future patients. As trainers, we face significant challenges to maintaining the high quality of training and we must now strive to deliver training in less time and in a far more distributed environment than before. To date, there has been no stipulation of the standard needed to become a surgical trainer. This situation differs in primary care where there is a recognised and rigorous selection and training process to be recognised as a GP trainer. It also means that GP trainers are properly recognised and remunerated for their role, whereas in surgery the training role is rarely rewarded. 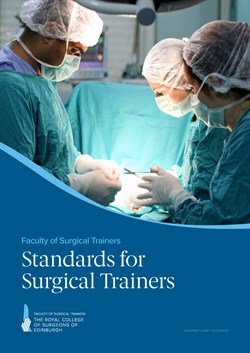 The Faculty of Surgical Trainers has now produced a set of Standards for Surgical Trainers. The GMC is planning to put in place a system of trainer approval for all trainers in secondary care. This means that by 2016 all those with a named training role (i.e. educational and clinical supervisors) will need to go through this process in order to maintain their training role. In effect, this will bring secondary care trainers into line with primary care trainers, who already have to be approved by the GMC. Further details can be found on the GMC website here. This GMC process of trainer recognition will entail demonstrating your activity as a trainer. The GMC has chosen a framework originally devised by the Academy of Medical Educators (AoME). This framework consists of seven domains (see below) in the field of education and training. These domains will be used to ensure that you carry out your job as a trainer effectively. This framework, however, lacks a surgical context and so the Faculty of Surgical Trainers has devised a set of specific Standards for Surgical Trainers. The evolution of these surgical standards can be found in this accompanying short webinar presentation. Our standards contain an explicit set of surgical trainer behaviours mapped to the AoME domains, which will enable surgical trainers to comply with the GMC approval process.